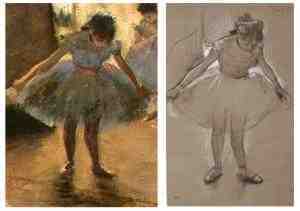 A prototype sketch of a dancer in 1878 materializes in a detail from an 1879 Edgar Degas painting at the National Gallery of Art website. Hey, take a look at the slight difference in the lighting angle, as evidenced by the legs' shadows. Then note the corresponding difference in the highlight area on the right arm. Geez, how do artists do that, anyway?